mommy's reviews: New York Style Bagel Chips Review, Giveaway & Sweepstakes Announcement! New York Style Bagel Chips Review, Giveaway & Sweepstakes Announcement! Ahhh summer. I love the weather, the picnics, the fun in the water and most of all, I LOVE summer foods! It seems like there are endless options when it comes to snacking but it seems like most of the foods are so unhealthy. While I love to snack, I hate the calories and fat that normally come with snacks so I am usually on the lookout for healthier options. My children also love to snack and I am constantly giving them little tidbits of food throughout the day. Like many parents, I am also disappointed that the foods that taste good to them are often the foods that I want to avoid. The snacks that are produced for kids these days are just plain unhealthy. Yes, there may be a bit of nutritional value to them but nine times out of ten, our children consume loads of junk food. In 1978, Jim Burns & Gary Ricker asked themselves a question that would forever change their lives – why not serve gourmet cheese samples on toasted bagel slices instead of crackers? Little did they know the answer to this question would change the way New York City and the rest of the world snacked. Soon, customers were not only buying gourmet cheese, but also the toasted bagel slices – by the deli bagfuls! And there you have it, Bagel Crisps® (and their iconic little bag that we all know and love) were born. And the rest of the story…well, let's just say it's history. I have heard of New York Style before and I think I have tried them but it has been awhile. Tasting new snacks is always fun and because I have done so many snack reviews, it is hard to decide exactly what my favorite snack is! :) I think after conducting this review I have a new favorite...these chips are delightfully amazing!! So, for this review I was sent a nice box of New York Style Bagel Chips and Bagel Crisps. I was sent Garlic and Sea Salt Bagel Crisps, as well as BBQ, Cheddar, Garlic and Sea Salt Bagel Chips. 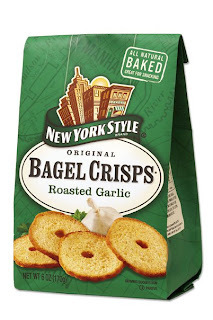 The first bag that I opened was the New York Style Bagel Crisps in Sea Salt flavor. I love the taste of sea salt and because I loved the idea that these crisps are baked and not fried, I was excited to try them out. The flavor is so fantastic. These crisps are super crunchy and very satisfying. It is the type of snack that you can put out in a small dish on the counter and grab a few crisps as you walk by. (I did that yesterday...as did my children.) You can also use these for dipping, adding to salads and also for an easy appetizer. Because they come in different flavors, you definitely have options. To purchase these and other New York Style snacks you can visit their website and find a store near you. Or, you can buy them online! They retail for about $3.50 per bag (which is not bad at all...they put alot in a bag!). New York Style, creators of the original deli snack, is teaming up with Stacy Keibler, “Style Star of the Red Carpet,” to unveil this season’s hottest tips for summer style, soirée and social snacking. 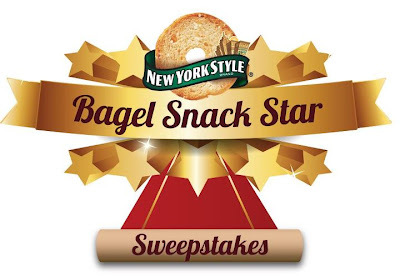 Together, they will launch the New York Style Bagel Snack Star Sweepstakes. One lucky grand prize winner will receive an exclusive VIP event for their friends and family at a local movie theater. Just like a star studded movie premier, the winner and their entourage will enjoy the glitz and glamour of the red carpet in their hometown. So, in my opinion...New York Style is a tasty and convenient way to snack! I love the crunchy and flavorful bagel chips and crisps that I was sent for this review and also I loved sharing them with my family. It is so great to know that there are healthy snacking options out there. I would definitely recommend this company's products to anyone, they are soo yummy! Disclaimer: I received no monetary compensation for this post. I did receive free New York Style products for review purposes. All quotes and stock photos are from the New York Style website and email. Prize is being provided and shipped by the sponsor. All thoughts and opinions are 100% mine. ny style pita chips... yum! I would like to try their Sesame flavor! Parmesan garlic herb pita chips look awesome!! I would like to try the Everything flavor of the bagel chips! I would love to try sesame! I'd like to try the BBQ flavor! Sea Salt and Cracked Pepper...sounds yummy! Sea Salt & Cracked Pepper! Love it! I want to try the Everything ones! I would love to try the roasted garlic! I would like to try Roasted Garlic. Cheddar would be my bagel chip of choice! I would love to try Roasted Garlic. I would like the Cinnamon Raisin.